Part of Martin's X Series, this Custom X-000CE Sonitone HPL acoustic-electric guitar combines that world-famous Martin sound with the contemporary playability of an electric guitar. Martin’s auditorium body is famous for defining the balanced acoustic guitar tone, with the right amount of bass, midrange, and treble frequencies. The body is constructed with Martin’s forest-friendly Jett Black HPL to give you an attractive visual look. This guitar was crafted to be a "player's dream." 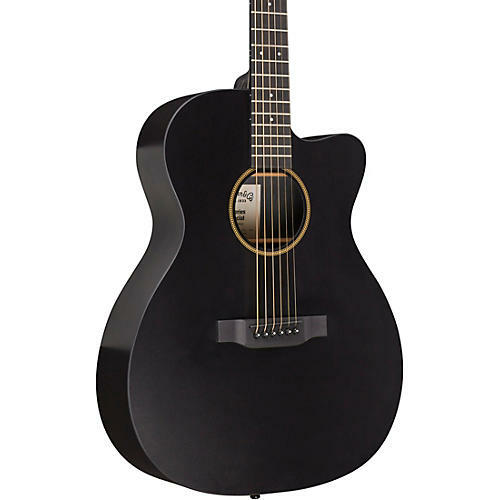 The X Series Custom X-000CE Sonitone HPL acoustic-electric guitar features a very playable laminate birch neck with a modified low oval neck shape. This precision-cut neck has fast FSC Certified Richlite fingerboard, and a 1-11/16 in. nut width, to give you a comfortable spacing between the strings. Looking for electronics? As its name suggest, this Custom X-000CE Sonitone comes complete with an onboard Fishman Sonitone preamp. This soundhole-mounted-preamp features easy-to-use rotary controls for Volume and Tone. The controls are mounted conveniently under the soundhole for easy access while you are performing. All you have to do is plug in and play. You’ll have a studio-quality sound right out of the box. This guitar is everything you’ve come to expect from Martin, at a price that just about anyone can afford. Pick one up. You’ll love the sound and playability of this fine instrument.